There was an accident in my kit, causing the end to get chewed up! I have a confession – I owned this slanted contouring brush for several years before I started to actually use it on a regular basis. No reason, no rhyme, I just didn’t really get why I needed to have such a tool, when I had other brushes to do the same thing – contour. Then I was schooled on the tool by fellow makeup artists, who showed me the wonder of this multi-functional brush. Applying blush, as well as highlighting the parts of your face you want to emphasize, including your cheek bones, and straight down your nose. 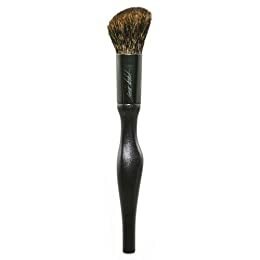 The angles of the brush make it perfect for applying darker colors to the parts you want to contour and de-emphasize. It’s also great for sweeping shadow from under your eyes. And believe it or not … so great for applying foundation! Since this brush is so great for contouring and highlighting, check this particular Breaking Down Beauty for more info on contouring and highlighting. Yes, I did draw a "3" on my face.